26 Newbattle Road, Newtongrange, Midlothian. Meetings: 2nd Thursday - September to April, at 7:00pm. At the turn of the century there seemed to be quite a number of lodges springing up all over the country. Indeed in our own Province of Midlothian no fewer than four lodges had petitioned Grand Lodge of Scotland for charters within a comparatively short time of one another. Before the lodge was formed, a number of the brethren, (who were later to become founder members), attended Lodge Dalkeith Kilwinning No.10. It may be interesting to note that Lodge Dalkeith Kilwinning No.10 applied to Grand Lodge of Scotland for a dispensation to hold a meeting in Gorebridge for the purpose of conferring the F.C. degree on 13 local brethren. Grand Lodge granted permission and the meeting took place in the Inn at Gorebridge. It was mention, the holding of this meeting in Gorebridge because of its significance, for soon after this, Grand Lodge banned Floating Charters and this was the forerunner of the forming of a Masonic Lodge in Gorebridge. The brethren got together soon after this and agreed to petition Grand Lodge for a Charter and that the name of the Lodge be Gorebridge Dundas. The reason for this was obvious, Sir Robert Dundas, First Baronet of Arniston being a great benefactor to the village and also was a Past Master of Lodge Dalkeith Kilwinning No.10. The founder members felt it would be a fine way to perpetuate the family name. The choice of the first Right Worshipful Master fell upon Bro. Sir Edward Moss of Middleton Hall, London Hippodrome, Empires and Music-Hall owner. The petition (completed) signed by the founder members and sponsors was presented to Grand Lodge craving permission to practice speculative Masonry in Groebridge and the charter was granted on the 6th February 1908. In 1912 a very important occasion in the History of the Lodge took place, namely the Initiation of Bro. Sir Henry Dundas. Sir Henry was appointed Sub-Grand Master in Grand Lodge and became Right Worshipful Master of Lodge Gorebridge Dundas No.1039 in 1914 and the appointment of Bro. Sir Henry Dundas Past Master as Provincial Grand Master of Midlothian in 1919. 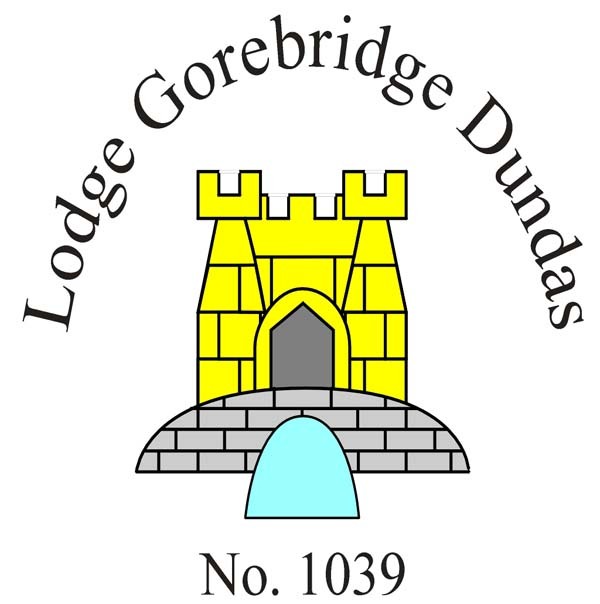 The brethren of Lodge Gorebridge Dundas can look back on the past 93 years with a great amount of satisfaction from what has been achieved and feel convinced that the prestige, Morale and Social Standard of the community has been enhanced by the coming of Freemasonry to Gorebridge. After 100 years in the village of Gorebridge, economic pressure made it necessary to sell the Lodge premises in 2009, resulting in the brethren at Gorebridge accepting the offer from Lodge Newbattle St Mary No.1036 to share premises in Newtongrange.